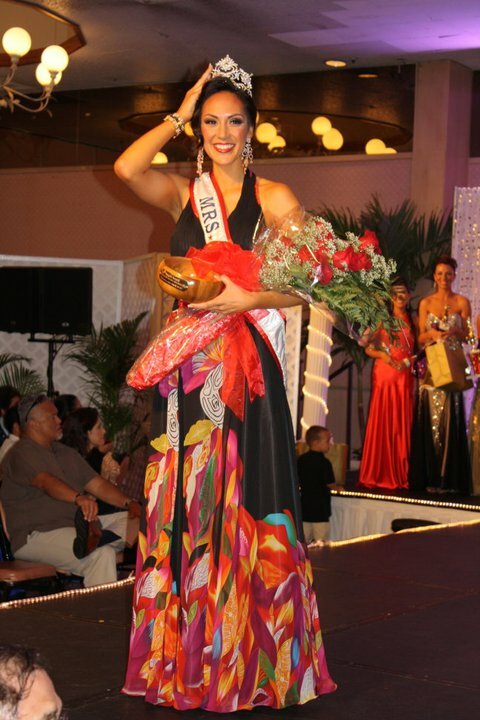 Our newly crowned Mrs. Hawaii, Lara Leimana Fonoimoana, 29, of Kahuku, is committed to fitness and nutrition. In fact, she has made the nutrition and fitness of Hawaii’s keiki her platform in her run for the national title. No, she is not one of those pageant people who hires a trainer six weeks before her walk on the runway just so she’ll look better in a bikini. Lara has been committed to fitness her entire life. Even as the busy working mother of a six-month-old son, Titus and three-year-old daughter, Athena, she always finds time for exercise. She has two jobs, one as a real estate agent and a second as a dancer at the Polyneisan Cultural Center, and a husband who often works 14 hours a day and commutes from Kahuku to town. Yet she still manages to keep fit. Always. Lara said she was a real tomboy when growing up. In high school she played volleyball and basketball and ran track. She played college volleyball until she tore her anterior cruciate ligament (ACL). She was so determined to keep playing that she tried to play again the following year and again tore her ACL. Today her workouts are little less high impact but no less strenuous. She works out six mornings a week. “I’m a morning person and it’s the best time to burn the most calories,” she said over herb tea at Starbucks. Her weekly workout regimen includes jogging the Kahuku path (a round trip of three miles) and following the P90X training regimen which calls for 90 days of intense cardio, weight training and band workouts. She doesn’t stop at 90 days, however. She goes pretty continuously except, of course, during pregnancy. She prefers therabands to free weights or machines because “I put on muscle really fast so bands give me a leaner look than weights.” On Mondays she works her shoulders, triceps and biceps, Tuesdays, lunges, squats and other lower body exercises, Wednesday, chest, back and shoulders, Thursdays she does an intense yoga workout or Pilates, Fridays, either upper or lower body and Saturdays cardio – “Anything that keeps my heart rate up,” she said with a cheshire-like grin. Lara also works on good nutrition for herself and her family. She begins her day with a smoothie consisting of spinach, brocolli, berries, coconut milk, protein powder and pomegranate juice. Athena loves it too. Lara said she’s just too busy to sit down to breakfast in the monrings so she has to have something she can take with her in the car. “It’s ideal because I know I’ve had at least half of my fruits and vegetables for the day, and so has Athena” she explained. The Fonoimoana family always sits down to dinner and Lara tries to cook healthy meals. Her main concern is that she knows what goes into the foods she is making. She makes an effort to buy ingredients that are as close to home as possible. With so many farms in Kahuku, this makes it a little easier. Athena’s diet is taking after her mother’s already. She loves fruit as her afternoon snack. She eats hard boiled eggs or one of her mother’s shakes when she’s hungry. Candy is considered a treat and is only eaten at a party. She is encouraged to try everything. If she tries something and doesn’t like it, sometimes her parents will disguise it with something she does like. At dinner on Sunday night, for example, she didn’t want to eat choi sum. “So we stuck it in with the rice and chicken and she loved it. Then we explained to her that she had been eating choi sum. She started eating it alone and discovered she liked it,” Lara said. I had to ask who is designing the gown she will walk in at the national pageant. The answer: Amos Kotomori. “It’s a shimmery gold and has these crystal ropes that go down the front and back and it has a gorgeous long train,” she said with a glint in her eye. Lara is Hawaiian, Asian, haole and Native American. This entry was posted in Fitness and tagged Amos Kotomori, Lara Leimana Fonoimoana, Mrs. Hawaii 2011. Bookmark the permalink. Great story and insight Paula! Lara is a truly beautiful person inside and out. It was a pleasure working with her during the pageant. I will be joining Lara, Pageant Director Luana Alapa and the rest of the Fonoimoana family to West Virginia to watch Lara compete! She will do Hawaii very proud!